They say that if you want to enact lasting change, start with yourself. 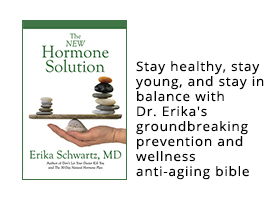 That's exactly what physician and bioidentical hormone expert Dr. Erika Schwartz did. In 1996, she was in her mid 40s. By that time, Schwartz was no stranger to overcoming obstacles—in her teens her family fled the communist regime of her native Romania for Rome. From there, with her sights set on the US, she earned a full scholarship to New York University, and then went to medical school. She became an emergency room doctor, successfully leading one of the largest tertiary care emergency centers in New York, and then built and directed the largest internal medicine practice in Westchester County. But at age 46, she faced a daunting dilemma that, even as a doctor, she couldn't fix—her own menopause. "The tipping point for me came when I was 46," says Schwartz. "I had a traumatic menopause, and at the time was trying the conventional route of taking Premarin® and birth control pills and feeling really, really horrible." Just like many of her patients. "I was bloated, severely anemic because when I started taking the Premarin® and birth control pills I started bleeding excessively and was gaining weight. This was not the way I wanted to age." Then a patient asked Dr. Schwartz to sign a prescription for hormones to be filled by a compounding pharmacy in California. Schwartz was curious and perplexed. "What exactly am I signing?" Schwartz asked her patient. The patient explained it was for special hormones mixed specifically for her symptoms. And the symptoms were exactly what Schwartz was experiencing. Schwartz agreed to sign the prescription but called the pharmacy for more information. "I said, 'I need to understand what you are doing with these compounded drugs. I was under the impression that only drugs that are FDA approved can be prescribed.' This is what I had been doing for 15 years," explains Schwartz. "He sent me some information which was not useful. However, my interest was piqued and I began researching this topic on my own." Because Schwartz was so desperate to find relief for her own symptoms, she ordered the same concoction of hormones, at the cost of $450. Within a week she received several powders and creams—some needed refrigeration, some were in syringes, some in jars—and all had elaborate directions. "It was insane," says Schwartz. "But when you're desperate, you do anything that you think will correct the problem. At 46 years old, I was not about to resign myself to a compromised old age." Being a scientist, Schwartz painstakingly and methodically investigated the literature on hormones. She finally assembled a workable protocol for herself that was based on published studies. Within a week she felt like herself again, and within six weeks, her weight had decreased, her mood stabilized, and she felt energetic. Schwartz knew she was on to something, but she needed the pharmacist's help if she wanted to make a difference for her patients, especially considering the enormous cost involved. After six weeks, she called the pharmacy again seeking guidance. She told the pharmacist, "I have a lot of patients with nondescript symptoms that no one wants to take care of, who are taking birth control pills or anti-depressants and/or sleeping pills and feeling horrible. Patients who will probably benefit from what you are doing, but $450 a month may be a burden on some of my patients who need this treatment the most." Dr. Schwartz was looking for a way to make this protocol more affordable for her patients. "Fortunately for me, this man said, 'I don't need you or your patients. I have enough here so go away.' So this is the guy I can thank for the rest of my life, because it prompted me to find a better solution," remembers Schwartz. "You know in everybody's history, there's that moment when we get rejected and that rejection turns into the biggest success of your life." 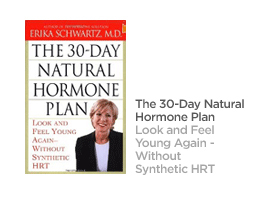 And so began Schwartz's journey to become one of the world's foremost experts and advocates for bioidentical hormones. Not one to give up, Schwartz instead contacted a local compounding pharmacy in New York that was compounding for hospitals. "The pharmacist was interested enough in sharing his information to bring me into his lab," says Schwartz. She then spent the next few years working with him and her patients developing a protocol that has become a gold standard of bioidentical hormone care. Schwartz now teaches it to physicians for continuing medical education credits. "The approach has stood the test of time, because 16 years later most of the patients I work with still line up within the protocols." It's also a procedure that patients and doctors can easily follow, notes Schwartz. Over the years, the FDA has approved some bioidentical hormones, some of which Schwartz uses in her protocols, but she will clarify that it's only the delivery method that's actually been approved. "The only thing that is different between compounded and FDA approved bioidentical hormones is the method of delivery, as in creams versus gels, patch versus oral. It's simply the vehicle through which the same hormone is delivered." Schwartz points out that for many doctors compounding hormones is unfortunately overly complicated, "because there aren't enough doctors teaching it the right way." Currently, there are no FDA-approved combination products or FDA-approved testosterone versions for women. "And women do need testosterone." 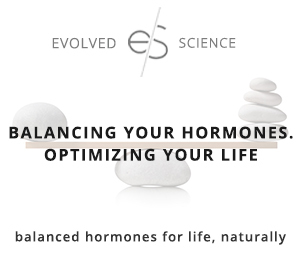 As Schwartz sees it, bioidentical hormones are the most natural way to restore hormone function. So why aren't more doctors using bioidentical hormones? According to Schwartz, the US got hoodwinked into believing that synthetic hormones, like Premarin®, were the only way to treat menopause and other hormone imbalances when the Women's Health Initiative (WHI), a massive nationwide research study, began in the 1990s. "Bioidenticals have been around since the 30s, but they got lumped in with synthetics by the FDA and NIH when the Women's Health Initiative occurred," explains Schwartz. The WHI was a 15-year study started by the NIH to find ways to prevent cardiovascular disease, cancer, and osteoporosis. The study compared horse urine-derived, unnatural to the human body estrogen (Premarin®)/synthetic progestin (Provera®) versus placebo, and horse urine-derived unnatural to the human body estrogen (Premarin®) versus placebo, with both products supplied by then manufacturer Wyeth Pharmaceuticals Inc. Premarin®was the typical choice as it had been around in the US since the 1950s, says Schwartz, but many physicians and patients alike were not aware that natural options also existed. What most doctors were unaware of was that European countries, such as Germany, have never used Premarin®. At the time, most doctors did not know there were more natural forms of estrogen and progesterone available, including an FDA approved bioidentical estrogen patch. According to Schwartz, the academic institutions were uneducated and uninformed and "took money and product" instead of researching other options. The results were catastrophic. The WHI ended up showing that the synthetic hormone options increased a woman's risk of heart attack, stroke and in some cases, cancer. "So, when in 2002 the WHI went bust because Premarin® and Provera® actually increased the risk rather than decreased the risk of cancer and heart attack and stroke, the party line became all hormones were the same." But Schwartz, and the head of the International Menopause Society (IMS), contend there is no class effect, meaning not all estrogens behave the same, and not all progesterones behave the same. "To say hormones have a class effect is an assumption that is critically wrong. It's an assumption that's affected more than 100 million women over the past 10 years." Editor's note: Life Extension's prior analyses shows that synthetic progestins (Provera®-Used in the WHI study) are quite dangerous and that natural progesterone (used by enlightened women) may confer protective effects. Conflicting data exists as to the safety of various estrogen drugs, but the preponderance of data indicates women in need of estrogen should consider a compounded formula of primarily estriol, with smaller amounts estradiol, and follow the safety caveats outlined on the website, www.lef.org/femalehormone. Despite international consensus that there is no class effect of hormones, except in the United States, Schwartz is fighting an uphill battle. "I am a conventional doctor, who for personal reasons, found another way that works better," says Schwartz. "And also discovered facts that maybe everybody should have known, including the physicians, who to this day, are still being brainwashed." "I see patients every day who come to me and say 'My doctor told me that bioidentical hormones are dangerous or don't work or not as effective as those made by the big drug companies," laments Schwartz. "To this day, things aren't changing dramatically, but hopefully with what I am doing and others are doing, it will keep getting better." Yes, Schwartz has successfully and healthfully moved through her own menopause. She's dedicated her medical practice to helping men and women change their lives through bioidentical hormones, proper nutrition, and stress management. 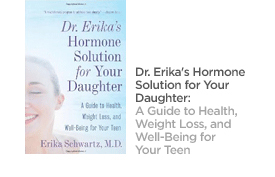 She's written four best-selling books, including The Hormone Solution, The 30-Day Natural Hormone Plan, The Hormone Friendly Diet, and Dr. Erika's Hormone Solution for your Daughter. And she's personally treated more than 20,000 patients around the world. But as she sees it, the power of big pharma is still influencing doctors. "Pfizer, who owns Wyeth, has such a huge hold over the academic institutions, NIH, and the whole pharmaceutical environment in which we function," says Schwartz. "As a result, medical knowledge is often dictated by the pharmaceutical companies, not by science. Around 2009, I was invited by the head of the department of OB/GYN at Harvard University to lecture on hormones because I had published an article in the Medical Clinic of North America. When I asked the OB/GYNs why is it that I, who am a clinician, have to do their research, they gave me a very disturbing answer," recalls Schwartz. "Their answer was that there was a whole generation of physicians that's been trained to prescribe Premarin® and Provera® and don't know any other way. These indoctrinated physicians will have to die out before a new generation of physicians can start prescribing to women what they truly need. I find that criminal." Interestingly, Schwartz still believes ignorance and lack of understanding is more to blame than money and greed. "It's not about the fact that you make more money with Premarin®. Yes, Pfizer makes money with Premarin®. But you can make a ton more money with estradiol and progesterone and you can also have healthier women who won't need to be taking antidepressants and sleeping pills," she says. "Women who won't be getting into car accidents because they are driving around like zombies." She asserts that the problem is simply not enough conventional doctors have taken the time to educate themselves on the use and benefits of bioidentical hormones. It is for this reason that she founded the non-profit Bioidentical Hormone Initiative to educate physicians and dispel the idea that there's a class effect with bioidenticals. "The moment you gain the support of the conventional medical world, you can make real differences." And real differences for men and women of all ages, says Schwartz, because, "everybody needs hormones, they are the juice of life." 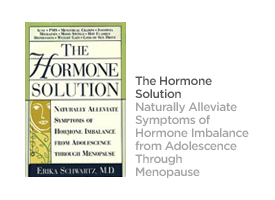 We all need hormones, Schwartz says. "And they prevent the need for antidepressants, which nobody needs. They're dangerous drugs. They're addictive. And trillions of dollars are spent on them. I can't tell you how many women and men I take off of them." For further information on Dr. Erika Schwartz please visit www.drerika.com.